During the Sept. 17 Delta College Board of Directors meeting, the Director of Facilities Management Michael Garr held a presentation on the Facilities and Measure L Bond update. Delta’s soccer field was mentioned during the presentation, specifically that it needed to be fixed. Currently, the Facilities Committee is in the process of investigating and scoping out the need to fix the soccer field. Dr. Steven Graham, humanities, social science, education, kinesiology and athletics division, said the soccer field was completed in the fall semester of 2008, with the renovation cost including the field, the track, disk, hammer and javelin complexes. He further went into detail of when the staff started noticing there was a problem with the field. He said coaches told him it was an immediate notice. The grass installed into the soccer field was the wrong type of grass. Currently, the grass can grow up to four and a half inches. Compared to the proper grass for soccer fields, called bermuda grass, which grows at a much shorter length, two inches. The second concern was that the ground was crowning too high, at four inches, where a normal crown for a soccer field is about one and a half inches. This can cause the ground to be too steep. The third issue is holes caused by the hammer throw complex. “If the bermuda grass had been installed, the holes would be easily noticed right away,” Graham said. Currently it is not the case, as at times the grass grows up to four and a half inches. This makes it hard to see them, making it a liability issue. The grass has caused some injuries on the field, according to Delta College soccer coach, Jordan Ferrell. “Some serious injuries to other teams, mostly minor to Delta College’s,” he said. Ferrell added that he didn’t know specifically if any athletes were hospitalized due to the injuries. Graham mentioned the original plans had shown there would be two soccer fields. The current one, would have been the practice field, with a second field used for the games.This second field would have been installed where the tennis courts are. Currently there are talks on how to fix the soccer field. One option Graham spoke of is the original plan. The other option is to close off a bit of the parking lot to increase the length of the soccer field. “We’re investigating what can be done to fix it,” said Graham. Its not just Delta complaining about the shoddy fields, most of the teams in the Big 8 Conference don’t enjoy playing on Delta College’s field, according to Ferrell. Ferrell described how big a difference it makes playing on Bermuda grass, saying that it was better for speed of play, the entire game feels different, passing is better with quicker decision making. 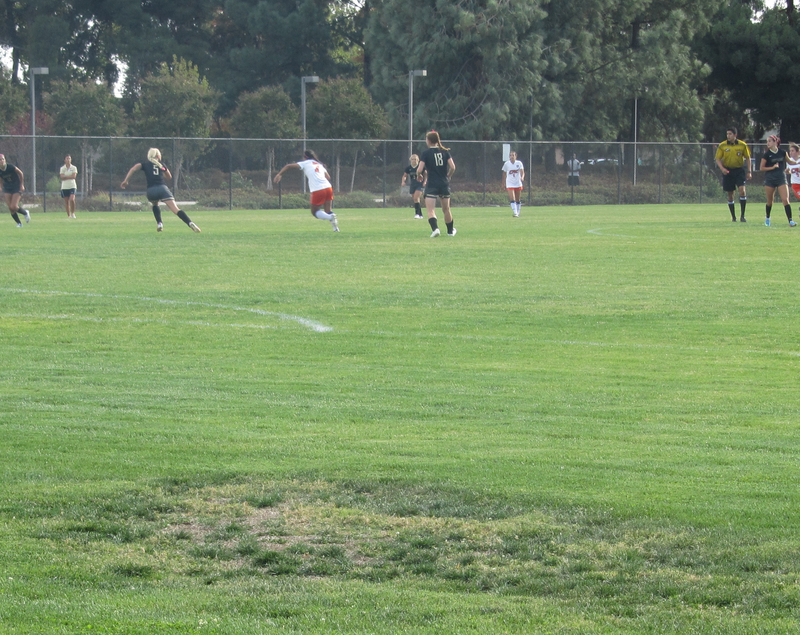 Playing on Delta College’s grass means a big adjustment.